EDITOR'S NOTE: With Euro 2012 reaching its crescendo and MLS nearing midseason, now is a fine time to pull up a barstool, order a cold one and enjoy soccer on the tube. To get you primed, Burgundy Wave continues its series of reviews of Colorado's best soccer pubs. Do you have a favorite place to watch footy? Suggest it for a review in the comments! SHERIDAN & 22ND AVE. -- It's undeniable that a genuine football culture, heavy on English partisanship, runs through GB Fish & Chips. But GB's also boasts a homegrown flavor, given that Denver native Conor Casey and some of his old South High teammates frequent the growing chain. The Colorado Rapids' all-time leading scorer is reputed to favor the GB Fish & Chips on South Broadway, the original GB chip shop. On Sunday, when England tussled to a tie (then more penalty kick futility) against Italy in the Euro quarterfinals, some of Casey's fans joined a full house of Three Lions loyalists at the GB's just west of Sloan's Lake. You immediately know which way the wind blows here when Sal, a GB regular, wryly observes, "Nobody flops like the Itals." That's the only flopping you'll see at this place. GB's stands tall in all the important departments -- footy atmosphere, food, beer and friendly vibe. 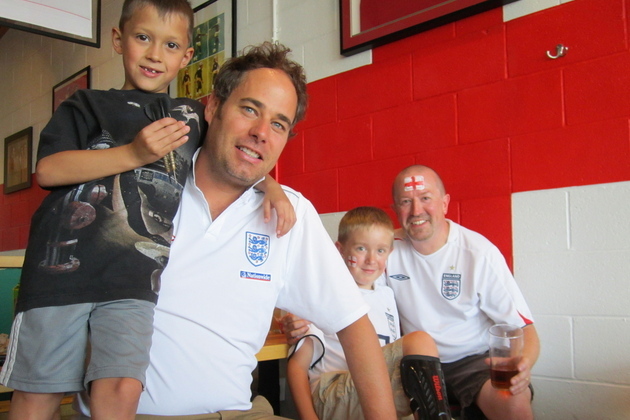 During Sunday's game, Simon Watkins and his two kids wore English face paint while friend Richard Thompson sported the Three Lions jersey. Watkins says the downtown soccer bars can't match GB, which lets kids eat free on Sundays, for family friendliness. "The food is great, they have a good beer selection and there's plenty of vantage points to watch the game," according to Watkins. Thompson likes the fact that the GB crowd has sophisticated soccer knowledge. "There's a culture forming around the game in the U.S.," he said. "It's just getting started. In here, you have kind of a nucleus of that. It's not just an English fish and chips place. It's a football venue." I speak for myself and my girlfriend in asserting that you'll be hard-pressed to find better fish and chips in Denver. Absolutely top notch -- and the tables are well-appointed with ketchup, malt vinegar and napkins. On this day, owner William Frankland watched England-Italy with friend Evan Eitemiller, who played alongside Casey back in the day at South High School. "Our whole family is from Middlesbrough," Frankland said. "… You can't go to England every time you want some fish and chips." His mother, Barbara Stokeld anxiously watched the English at a corner table. She hand makes the dough for GB's pork pies, pasties, shepherd's pie and all the desserts. "I am the REAL celebrity here," she said, proudly jutting her British jaw. Frankland's cousin Alex is the original owner. Frankland and his cousin Cyrus are currently part-owners of GB Fish & Chips. Eitemiller loves the GB vibe, saying he can walk into any location -- a third shop recently opened at 5325 E. Colfax Ave. -- and find somebody he knows. "I like the bangers and mash, even though it's a fish and chips place," Eitemiller said. Soccer jerseys festoon the Sloan's Lake location, including a signed Casey jersey from his U.S. National Team stint and a framed (and signed) Pele jersey from the master's Cosmos days. The 2010 Cup-winning Rapids squad signed a burgundy banner hanging in the front window. Frankland said GBs runs shuttle vans to DSGP for big Rapids games. Thompson likes the fact that people don't just come into GB to drink. "People who know Conor, this is where we come," he said. "There's the blood from Colorado running through this place." And, on a day when Ashley Cole, Steven Gerrard and Wayne Rooney stumbled against the Italians, the blood from Britain ran hot -- then grimly cold. 0 - Awful, horrible. You call this place a soccer bar? 1-3 - Poor. You trying to model your bar after Toronto FC? 4-6 - Decent. A reasonable joint, but you could have done a lot better. Fish and chips. Wow. Enough said. Also notable is the fact that they stuff their own Bangers and the family matriarch personally makes the dough for all of GB's carbs-rich delights. GB, by the way doesn't stand for Great Britain, as you might think. It stands for Get Battered Fish & Chips. Enjoyed the Denver IPA by Great Divide, but noted that GB is well-stocked with most every other choice brew -- import and domestic. Authentic neighborhood fish and chips shop vibe. Patrons are friendly and, even when seats are at a premium for a big game, people will make room for you. Only downside is that it gets a little warm in late afternoon by the huge Sheridan-facing windows. The crew was swamped with the huge England-Italy crowd, but kept nobody waiting. Every beer, every plate of English delicacy was served up with a smile. Our ticket for a 6-piece fish & chips (huge portions) and two microbrews was only $20. I'd call that a very good value. Soccer savviness oozes out of the place, at least the Sloan's location. Only reason I didn't go 10 is because if you're a partisan bloke for any team besides England, you might feel a little out of place.